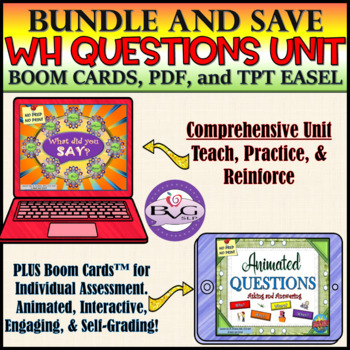 This is a complete comprehensive BUNDLE of the Asking and Answering WH- Questions and the Animated Questions Boom Card lesson. This comprehensive BUNDLE includes BOTH the PDF unit and a Boom Card Edition. 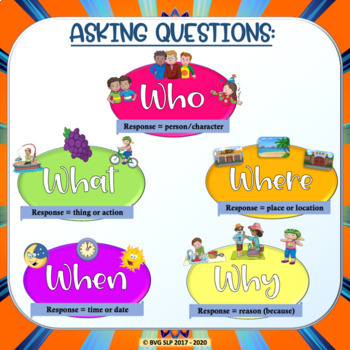 These two lessons together are a very comprehensive way to explicitly teach students how to ask and answering 'wh' questions in a fun, engaging way. I personally like to use the What Did You Say? PDF lesson as a whole or small group instruction tool. This provides an opportunity to teach, practice and reinforce the concepts while using full-color images to keep students engaged. The Boom Card version of this lesson is great for additional practice during small group or can serve as an individual assessment of the concepts. Allow students to work independently to determine their level of understanding and to monitor progress. The Boom Cards are fully interactive with point and click functionality, they provide immediate feedback, and best of all, they are self-grading to save you time. The Boom Cards include ANIMATED images that keep your students engaged and having fun while learning. 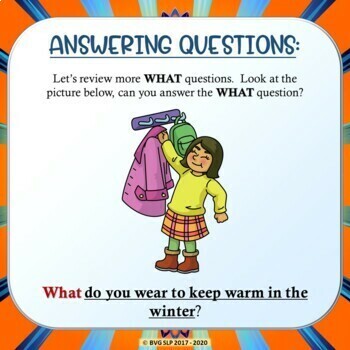 Do what works best for you and your students as both units are very versatile and full of opportunities to address asking and answering WH questions. Both units are full color NO PREP, NO PRINT! Please click on each link to see exactly what is included in this BUNDLE. If you like this unit, please take a look at my "Boom Cards: Rhyme Time", "Google Digital Interactive Notebook:All About Me, "Google Digital Interactive Notebook Objects and Functions", "Google Interactive Following Directions", "Spring into Language", "Multiple Meaning Words", "Animated Vocabulary", "Same or Different", "More or Less", "Rhyme Time", and "Can You Describe That" lessons which are great accompaniments to continue teaching important foundation skills. Please don't forget to rate and comment for credit towards your next purchase. I hope you enjoy this lesson with your students as much as I do with mine. Be creative and have fun teaching! Stay tuned for more Boom Card lessons. Thank you for shopping in my store and please come back often for new lessons, freebies, and promotions. Disclaimer: BVG SLP is not affiliated with nor endorsed by Boom Learning℠. Both Boom Learning℠ and Boom Cards™ are registered trademarks of Boom Learning, Inc. Logo and names used with permission.